Tip: Remove star anise from plate before eating. Preheat oven to 230°C. Place pork skin side up in a roasting pan, rub with oil and sprinkle with a little salt. Bake for 20 minutes then reduce heat and continue baking for another 40 minutes. To prepare relish, heat oil and lightly fry star anise and ginger. Add eschallots, sugar and soy plus 2 tbsp water and simmer gently for 10 minutes. Add strawberries, simmer a further 5 minutes. Cool slightly, taste and season with cracked pepper. 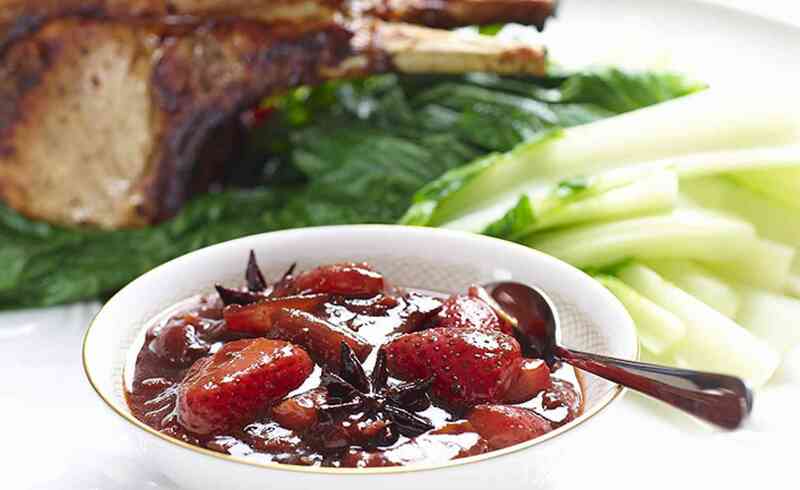 Serve crisp pork loin thickly sliced on a bed of steamed Asian greens with a generous dollop of relish.